Academic powerhouse Rutgers University and the health system RWJBarnabas Health have officially launched their public-private partnership, a deal that will spur the hiring of 100 new researchers and embed Rutgers' medical students and faculty members into RWJBarnabas' hospitals and other facilities. Leaders with both organizations said Tuesday that their definitive agreement, signed one year after their letter of intent, will create New Jersey's largest academic health system, with RWJBarnabas, a system with more than $5 billion in revenue and 11 acute care hospitals, overseeing clinical services. Rutgers will be in charge of academics and research. The partnershiph will create a new joint medical group and a committee with equal representation to oversee strategic planning. Rutgers President Dr. Robert Barchi told reporters on Tuesday there is no charity on either side of the deal: Rutgers needs a clinical partner where its faculty and students can train and research, and RWJBarnabas needs cutting-edge ideas and top clinicians to treat patients at its facilities. "There are very few times when two organizations of our size enter into a partnership that is purely mutually beneficial," he said. "This is one where the synergies are on both sides." 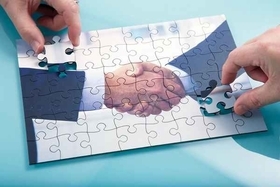 Under the deal—which is not a merger and, as such, only needed approval from the organizations themselves—RWJBarnabas has committed to investing $100 million in the integrated system up front, followed by more than $1 billion over 20 years. The money will pay to recruit new leadership, faculty and 100 principal investigators over the next decade, a move Rutgers expects will double the amount of research funding it receives from the federal government. Another $10 million will support Rutgers medical school graduates who agree to practice in New Jersey. The money will also help grow residency and fellowship programs statewide; increase clinical training opportunities for medical, dental and other health professional students; and expand access to clinical trials. Barry Ostrowsky, RWJBarnabas Health's CEO, said the average $50 million investment per year over 20 years is just a base; he expects the organization will make additional payments based on the combined organization's success. "Frankly, we look forward to investing more than $1 billion over 20 years for the support of academics and medical research," he said. "That is at least the investment our organization has agreed to make in pursuit of the goals of this relationship." Rutgers and RWJBarnabas will create a new medical group comprised of employed physicians and other healthcare professionals from both organizations. The group, which will be finalized in the coming months, will have its own CEO. The organizations haven't decided what they'll call the medical group, but it will fall under a common branding scheme the system plans to roll out, Barchi said. The partnership won't change people's employers, whether that's Rutgers or RWJBarnabas, nor will it affect their benefits. "There is no transfer or rebadging going on here," Barchi said. RWJBarnabas will also pay for the construction of a new Rutgers Cancer Institute of New Jersey facility to expand the current main facility in New Brunswick. Ostrowsky said the organizations found a site, but it will be at least 3 years before that facility comes online. The health system also plans to build an ambulatory care center near or even adjacent to the Robert Wood Johnson University Hospital in New Brunswick. That project is also a few years out. RWJBarnabas hasn't determined whether those will be funded through philanthropy, debt or capital investment, Ostrowsky said. "We expect there will be donors interested in supporting this in a number of ways," he said. Dr. Brian Strom, chancellor of Rutgers Biomedical and Health Sciences, which includes eight schools, added that Rutgers plans to renovate its Medical Science Building in Newark and build a new education and research building in New Brunswick, although the timing, size and location have not been determined. The partnership will expand the number of clinical trials Rutgers performs, which will in turn draw new patients into the RWJBarnabas system and benefit the state's population, Strom said. New Jersey's healthcare industry has seen a flurry of consolidations in recent years. Hackensack Meridian Health and JFK Health finalized their merger in January to create a 16-hospital system with 160 ambulatory facilities. Virtua Health in Southern New Jersey announced in June it plans to buy two of Trinity Health's hospitals in the state that were at the center of a failed acquisition deal with another local health system. The partnership will also expand RWJBarnabas' social programs by sending healthcare professionals into communities to help people navigate the healthcare system, Ostrowsky said. "This in our view fulfills our obligation to deliver not just conventional clinical care, but to expand it with social services support that benefits from academics and research to construct more neighborhood-focused healthcare venues that will make, we think, our communities better," he said.